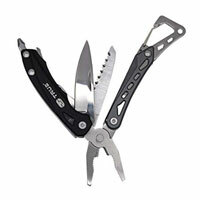 Adventure safely with reliability of the Seven multi-tool. Taking its name from the shape of the built-in carabiner attachment, the Seven is a high-quality tool crafted from anodized aircraft-grade aluminum. Its ergonomic handle offers a comfortable grip when using any of the seven essential tools, such as the fine, non-locking blade, wire cutters or ever valued bottle opener. The built-in carabiner attaches to anything, with a quick release clip offering easy on/off access. The AngleLite offers an easy, one-handed operation from a smooth and stylish directional LED key ring flashlight. You should never leave home without these two.